I called it crazy because I used unusual combination of ingredients for this snack. Just threw in leftovers from the refrigerator and turned it into a delicious snack. But trust me, it is super delicious. Take idli batter into a large bowl. Add onions, cilantro, green chilies and rice flour to the batter. 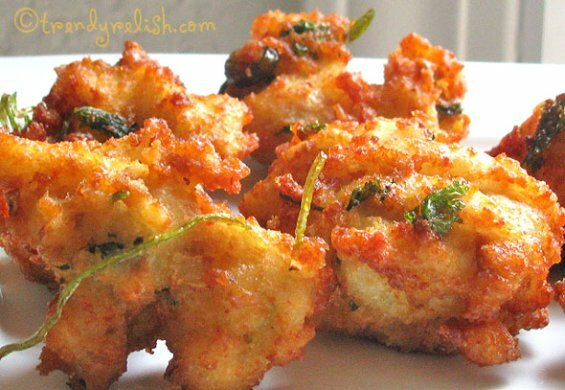 Crush the idlis coarsely with hand and add to the batter. Dip the buns in water, squeeze to remove excess water and press with hand to make a paste. Add this to the batter too. Mix the batter well to make sure there are no lumps. 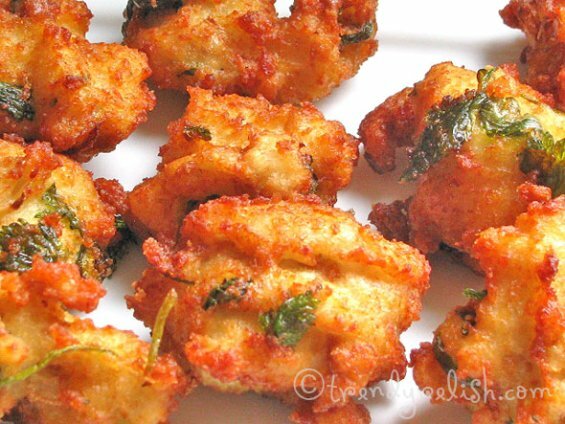 No need to add any water to the batter as it needs to be thick like pakoda batter. Add salt to the batter and mix well. Pour the oil in a pan and heat. When it becomes hot, take small portions of the batter with a spoon and carefully drop into the hot oil. Fry till they turn golden brown in color and take out from the oil. Transfer them to a paper towel to get rid of excess oil. Repeat the same process with the remaining batter. Enjoy this hot and yummy snack with a cup of tea/coffee. Perfect on a rainy day!! Have a wonderful year ahead and a very happy new year to all of you!! Very creative crispy snacks Uma..looks fantastic and prefect for this cold evening..
not crazy.............but sure ymmy uma........nenu chestanu kani idli and bread add cheyyanu. I love recipes like this so nothing gets wasted :) They look delicious! Last week I did the same too. I had some dhal soaked in the refrigerator,coarsely ground them in the mixer to which I added some Idli batter some bread and other spices,it turned out nice and crispy and my daughter wanted more. I am sure I cannot replicate the same. Wishing u & ur family the same..Happy Holidays & Happy New Year!! very creative one...looks so crispy and delicious. They looks terrific and absolutely delicious..
One lovely dish, love to have that plate. Wow.. crispy snack with all left-overs.. good idea uma! how are you da?? Oh your saying crazy but seeing oh god looks soooooooooooooooo yummy and crispy. Looks so crispy and yummy....perfect tea time snack, dear! !...love the way u named it! !...very very tempting! This has gotta be your craziest snack yet! I need you here to deal with my leftovers, or an imagination like yours. Yummy Yummy !!!! Happy and prosperous New Year 2010 to you and your family. WOWWW!!!.... wonderful recipe.. looks perfect.. Awesome clicks!! Really tasty! The pictures speak for that! We make with leftover dosa batter but never mixed buns! They look very yum! haha sounds craZy but look super duper. so crisp and nice.... happy new year!! congrats on the new domain. Does sound crazy....but looks so delish. Happy bloggiversary and a happy new year to you.